Tyrone Hayes, his long hair tightly pulled back into a bun, sat where he sits for a good few hours almost every day - at a small, round table in Jupiter, a restaurant and bar on Shattuck Avenue. A beer - their signature brew - is the only thing on the table besides his laptop. But for the greater part of his work life, Hayes, a professor of integrative biology at UC Berkeley, lives in a cluttered but comfortable laboratory in the Valley Life Sciences Building. There, he researches atrazine, an herbicide which is sprayed in quantities of about 80 million tons a year across crop fields and on residential lawns. For the last eight years, Hayes' research on the herbicide has become the focal point of a conflict between the chemical's producer, Syngenta Corporation, and scientists researching its effects. Hayes was brought into the media spotlight in July when the corporation filed an ethics complaint with the University of California for e-mails Hayes had written, some of which were explicit, which he said were a response to threats from Syngenta employees. The subject of the controversy, atrazine, is currently the topic of a bill introduced in April in the U.S. House of Representatives seeking to ban the chemical, a re-evaluation by the U.S. Environmental Protection Agency (EPA), and two class action lawsuits filed by communities and water companies in the Midwest that allege Syngenta has placed hundreds of thousands of dollars in costs on the communities to purify herbicide-tainted drinking water. Atrazine was banned in the European Union in 2003. The herbicide has been a major subject of Hayes' research for more than a decade, dating back to 2000, when Hayes was a consultant for Syngenta. Since 2002, Hayes has published three studies - one in the journal Nature and two in the Proceedings of the National Academy of Sciences - that demonstrate negative effects of the chemical on the sexual development of amphibians. Atrazine functions as an herbicide by disrupting photosynthesis. But when animals, like frogs, are exposed to it - even at levels below EPA regulations - it interferes with the production of estrogen, increasing it to a point where male frogs are "chemically castrated" and 1 in 10 are turned into females, according to a March study Hayes published in the Proceedings of the National Academy of Sciences. While several studies corroborate Hayes' findings that atrazine is detrimental to organisms, not all agree that the herbicide is dangerous in low concentrations. "To my knowledge (and I have participated in two EPA panels that reviewed available results) nobody else has been able to get this ultra low concentration effect," said David Skelly, a professor of ecology at Yale University, in an e-mail. Syngenta has maintained that atrazine poses no adverse health effects to any species, claiming that Hayes' work has multiple errors and is not reproducible. "Over 6,000 studies conducted by Syngenta and others over the years have established the safety of atrazine," said Syngenta's Principal Scientist Tim Pastoor in an e-mail. "The most comprehensive study ever done on the subject - Kloas 2009 - found that atrazine had no effect on frog sexual development. If Dr. Hayes were to provide all his raw data to EPA for careful examination, as Syngenta has done with the Kloas study, the Agency would be able to evaluate the quality of his research and his claims concerning atrazine. Until then, however, his results cannot be considered reliable." The allegation that Hayes will not share his data with the EPA is "blatantly false," Hayes said. He said he let the agency into his lab for three days in 2002 to collect data, and in September of the same year, Thomas Steeger, a senior EPA scientist, sent him an e-mail thanking him for his cooperation. "Although you are not required to provide EPA with any information, you have been very cooperative and have shared both the raw data and standard operating procedures from your research," the e-mail reads. Gail Prins, a professor of physiology at the University of Illinois at Chicago who signed a letter with 15 other scientists addressed to UC officials supporting Hayes' work, said Syngenta's inability to replicate Hayes' exact results is not relevant. "I know that what Dr. Hayes does is solid. It's done with appropriate scientific methods, the data is reasonable, and it's solid good research," she said. "In science, very rarely is anything identically repeated." Both in 2003 and in 2006, EPA re-approved the use of atrazine. In 2007, after reviewing the Kloas study, the EPA stated there was no compelling reason to further research atrazine's effect on amphibian gonadal development. But with a new presidential administration and new leadership at the EPA, the agency has decided to reconsider the issue of atrazine sooner than expected. According to a statement from the agency, "the substantial new scientific information generated since the 2003 reregistration decision and the documented presence of atrazine in drinking water sources and other bodies of water" also prompted the agency's decision to reevaluate the herbicide. The EPA held hearings in April and again in September, at which Hayes testified, presenting his newest research, which is set to be published in February 2011 with data contributed from 18 other labs in 12 different countries. In the study, Hayes said he and his colleagues looked at the effects of atrazine on gonadal development on a wide range of species, from mammals to amphibians to reptiles. In addition to the February study, Hayes said he has another much larger study with 40 co-authors in the works examining the same broad set of species. "I think (Syngenta is) concerned about that because even though they may be able to attack me - or try to attack me - you can't take 19 laboratories from around the world and say they've all done something wrong," Hayes said. 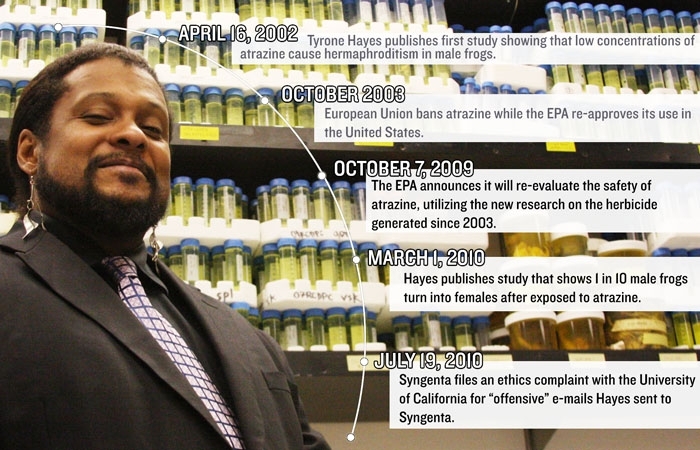 A previous version of this article stated that Tyrone Hayes is an assistant professor of integrative biology. In fact, he is a professor.